The GLBT Historical Society’s archives include over 500 oral histories conducted with Bay Area residents from the 1980s forward. Our ongoing oral history project, Voices of the Past, aims to record aspects of everyday life in past decades, particularly for LGBTQ people from underrepresented groups. Many of our oral histories have transcripts. You can use our catalogue search function to research our oral history collection. In addition to our standing oral history project, we are currently managing two special oral history initiatives. The GLBT Historical Society sponsors a wide-scale oral history project to chronicle, preserve and share the history of ACT UP/San Francisco and other AIDS direct-action groups in the city. ACT UP/San Francisco was a highly visible and influential group of militant AIDS activists associated with a national network of independent organizations that shared the name AIDS Coalition to Unleash Power. ACT UP/San Francisco emerged from earlier AIDS direct-action efforts in the city starting in 1984; it remained active into the mid-1990s. The project will document this wider context by also gathering oral histories on AIDS direct action by other local groups, including Enola Gay, the ARC/AIDS Vigil, AIDS Action Pledge, ACT UP/Golden Gate and Prevention Point. In addition to creating historical documentation, the project aims to foster dialogue between ACT UP veterans and younger organizers active in the current upwelling of social justice organizing. The initiative will train people ages 18–29 to conduct oral histories and to actively shape project outcomes. Through round-table conversations, listening parties and other public events, the project will draw on the history of AIDS direct action in San Francisco to inform contemporary resistance. Oral histories with at least 40 former members of ACT UP/San Francisco to be permanently archived and maintained by the GLBT Historical Society. An exhibition at the GLBT Historical Society Museum incorporating high-quality documentary-style video portraits, photos, and other materials. A series of culminating public events offering opportunities for dialogue and debate. Through oral history recordings, the project will document ACT UP/San Francisco’s legacy of protest and politics. In addition, the project will focus on the unique artistic and sexual cultures fostered through the constellation of San Francisco groups of which it was a part, including AIDS Action Pledge; Mobilization Against AIDS; Stop AIDS Now or Else (SANOE); Queer Nation/San Francisco; Boy With Arms Akimbo/Girl With Arms Akimbo; Bad Cop/No Donut; Diseased Pariah News; and Transgender Nation. The current project director is Eric Sneathen, a poet and doctoral candidate in Literature at the University of California, Santa Cruz. With Daniel Benjamin, he is the co-editor of The Bigness of Things: New Narrative and Visual Culture, and he organized a series of essays and interviews focused on the intersection of gay liberation and queer writing for the San Francisco Museum of Modern Art’s Open Space platform. The recipient of the American Historical Society’s Allan Bérubé Prize for work in public history, Joey Plaster originated the San Francisco ACT UP Oral History Project, leading trainings and conducting interviews from 2017 to 2018. From his current position as Curator in Public Humanities at Johns Hopkins University, he continues to advise the project staff. Interested in sharing your story or volunteering? Contact Eric Sneathen. To take part in the conversation and get regular updates, join the Facebook group. Gerard Koskovich, a public historian formerly active in ACT UP/San Francisco, Queer Nation/San Francisco and Bad Cop/No Donut. Click above for a video about the Dyke March Oral History Project. 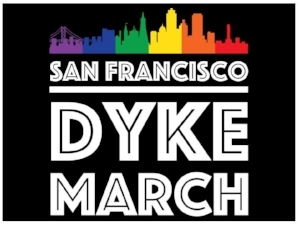 The Dyke March Oral History project is a newly created audiovisual collaboration between the GLBT Historical Society and the San Francisco Dyke March. The project aims to capture and preserve the diverse experiences of dykes, lesbians and queer folk from all communities over the nearly three decades of the San Francisco Dyke March. In conceptualizing this project, the Dyke March and the GLBT Historical Society wanted to increase the number of diverse queer women’s stories in the archives and emphasize the role of the Dyke March in empowering women to share those stories. Collect and record oral histories focusing on the history of the Dyke March and dyke activism and life in the Bay Area, to enrich our community with shared stories of groth, belonging, and strength. Use the oral histories to help create an exhibit celebrating the 30th anniversary of the Dyke March, scheduled for June 2023. This can be through all varieties of social media, email or word of mouth. Please feel free to share the link to this project page and our promotional video wherever necessary. This project is funded by a combination of community donations, individual donations and grants. The money raised will go towards video and sound editing, video storage, filming equipment maintenance, event promotion, space rentals and conservation costs. This project will be funded by a combination of community donations, individual donations and grants. Please donate here. Sign up to share your story! This project strives to include as many stories as possible to represent the diversity of communities that attend the Dyke March. No anecdote is too small. Please contact either Marilyn Rose or Nalini Elias for details about interview spaces and times. Volunteers are needed to help with the filming process. Additionally, volunteers are needed throughout the year at events and with promotion and tabling. Contact Nalini to receive a detailed description of volunteer responsibilities, or fill out the volunteer form here. Contact Marilyn Rose at the Dyke March or Nalini Elias at the GLBT Historical Society for more information about this project.